Applause for My First QUEERTY Post! October 31, 2013 // Beauty, Faces, Fashion, Gay, Um, Weave, Why? Today is Halloween, but for Lady Gaga it’s just another Thursday. Though most of us mere mortals can barely come up with one good costume idea, the pop diva formerly known as Stefani Germanotta — and her army of assistants, stylists and assorted minions — conjures up at least three absurd getups before breakfast each and every day. 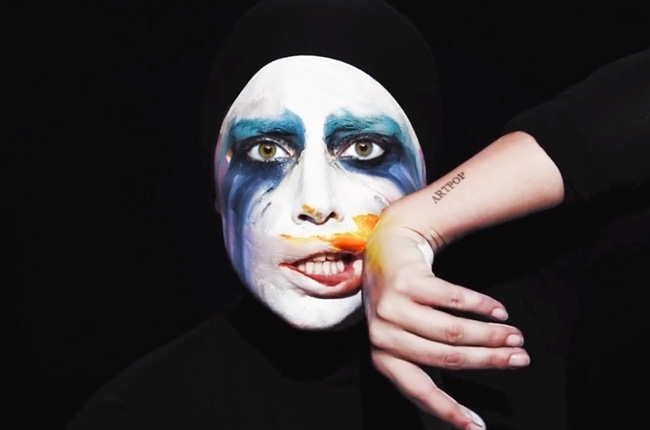 With meat dresses and Jo Calderone long dead and buried, the week leading up to All Hallows’ Eve found Mother Monster promoting her new album ARTPOP in eight new ridiculous over-the-top outfits. While we long for the day Lady Gaga truly shocks by wearing jeans and a t-shirt, until then check out her latest scary Halloween costume fashion parade. Boo! Britney’s Album Art — I’m Just Being Miley! October 25, 2013 // Beauty, Faces, Fashion, Um, Weave, Why? Jake Gyllenhaal — THE LOVELY BONES! 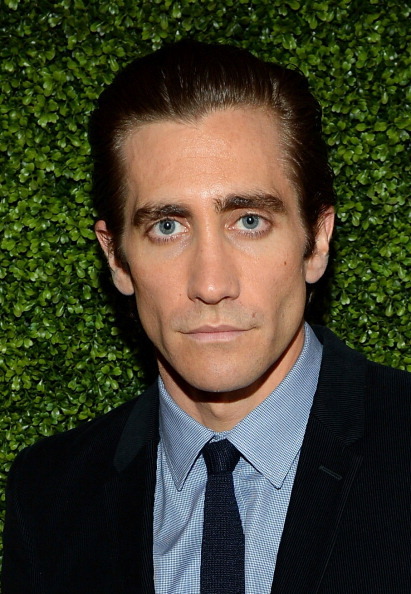 While normally fit and buff, Jake Gyllenhaal showed off a much more emaciated and gaunt cracky look at the Hollywood Film Awards on Monday. Johnny Depp isn’t the only hunk going lighter these days. 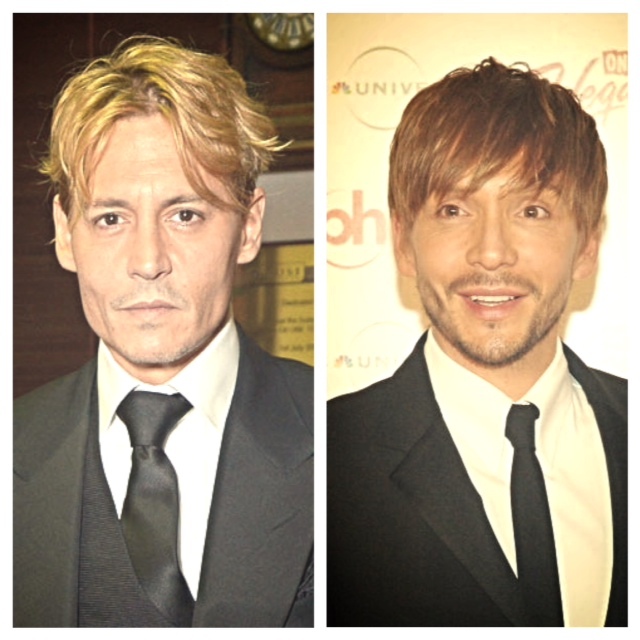 Johnny Depp — Celebrity Hairstylist?! Here’s Johnny Depp showing off his fierce new honey highlights at a London premiere this weekend — and Jessica Simpson’s weaveologist Ken Paves a little while back. No word on the whereabouts of Johnny’s hat. 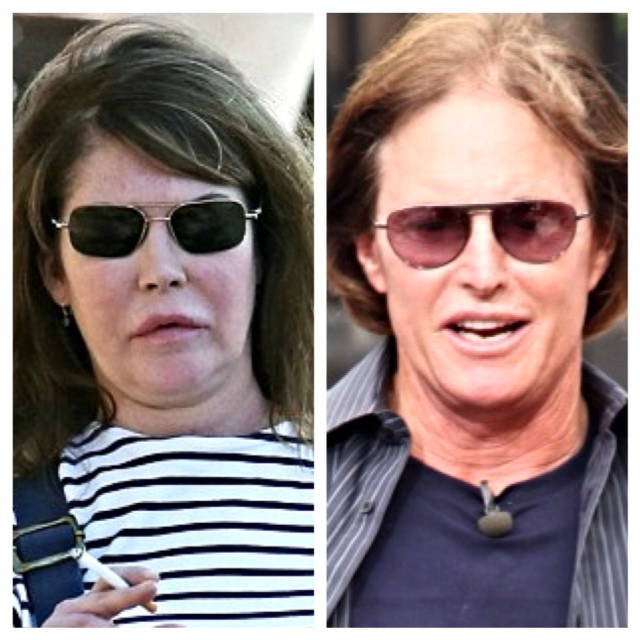 Lara Flynn Boyle — They Call Me Bruce! October 19, 2013 // Beauty, Drag, Faces, Fashion, Man, Um, Weave, Why? Here’s former actress Lara Flynn Boyle, 43, who resurfaced in a parking lot in Bel Air this week — and Kris Jenner‘s estranged husband Bruce Jenner, 63, earlier this year. Only one is smokin’ hot. Cougars Run Wild in Beverly Hills! October 19, 2013 // Beauty, Faces, Fashion, Weave, Yes! 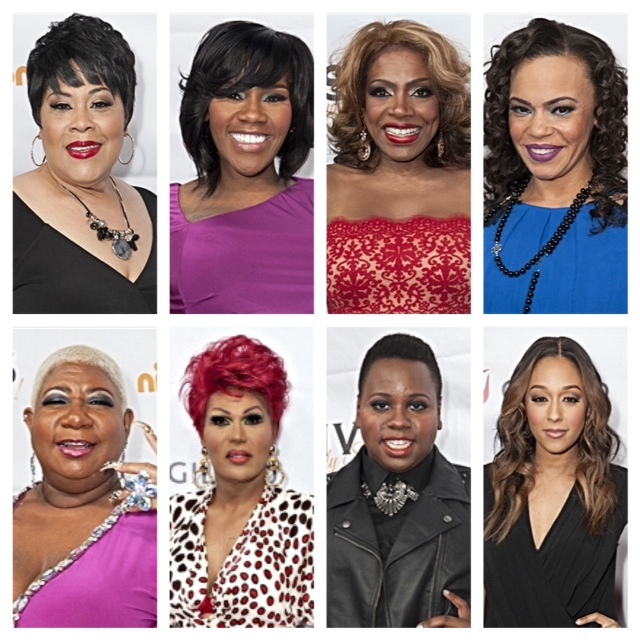 The over 40 and fabulous crowd served some major face at the Wallis Annenberg Center for the Performing Arts Inaugural Gala in Beverly Hills last night. 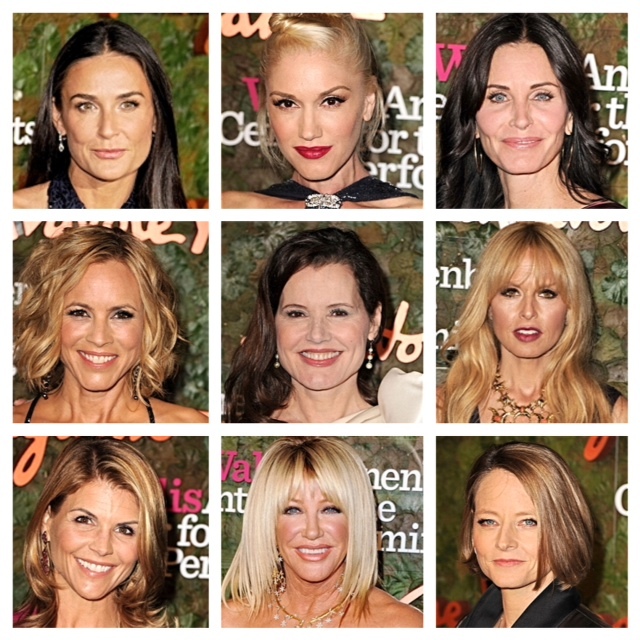 Demi Moore, 50, a preggers Gwen Stefani, 44, Courteney Cox, 49, Maria Bello, 46, Geena Davis, 57, Rachel Zoe, 42, Lori Loughlin, 49, Suzanne Somers, 67, and Jodie Foster, 50, were all ready for their close-ups and looking damn good. Strangely, Bruce Jenner was nowhere to be found. Sly & Valentino: Fine Italian Leather Goods! October 16, 2013 // Beauty, Faces, Fashion, Gay, Man, Um, Weave, Why? 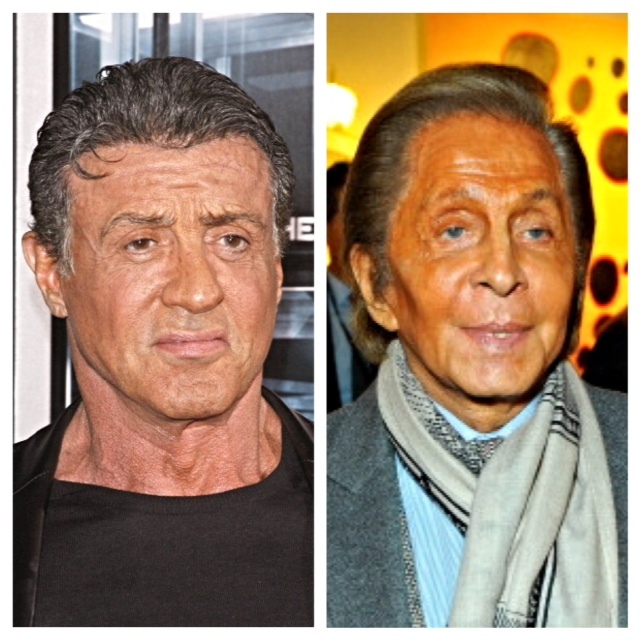 Showing off the exquisite craftsmanship and uncompromised quality of the most luxurious handmade Italian leather upholstery, Sylvester Stallone, 67, and fashion legend Valentino, 81, put their tanned hides on display while on opposite sides of the pond this week. As Sly’s expensive dewy glow lit up the Big Apple for the premiere of “Escape Plan,” Valentino’s vintage caramel shell cooled beautifully in the crisp London air. Kate Winslet — Gorgeous for Two! October 14, 2013 // Beauty, Body, Faces, Fashion, Yes! No one can do a bump like “Titanic” beauty Kate Winslet. The 38-year-old Oscar winner showed off her stunning maternal glow at the London premiere of her latest film “Labor Day” on Monday. Kate is due by the end of they year. This will be her third child, but the first with her fourth husband, Ned Rocknroll. October 14, 2013 // Beauty, Body, Faces, Fashion, Um, Yes! Sandra Bullock may be soaring through space — and the box office — in the movie “Gravity,” but underrated performer Pink was actually doing it at the Staples Center on Sunday night. While everyone else is trying to keep up with the latest Miley twerk or Gaga stunt, the 34-year-old diva’s The Truth About Love tour put on one of the best concerts ever by featuring dancing, acrobatics, piano playing and even LIVE singing. Your move, Britney’s Vegas show! So what … P!nk is definitely a rock star!